Here's another favorite that is so quick and easy to make. Plus, it's a build your own so everyone can have what they want inside. 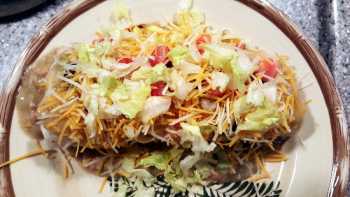 These burritos can be served with beans and rice, but let me tell you this; the burrito alone is so filling that you can skip the extras. The recipe calls for 1lb of ground beef. That's because this will serve 2 - 4 people depending on how much meat each person adds to their burrito. Usually a 1/4 pound of ground beef is enough per burrito. Not to mention that after you include your fillings, more than a 1/4 pound would be hard to roll. You will notice we do not over spice our ground beef because with the fillings and smothering of the burrito, the beef really doesn't need much seasoning. Just some salt, pepper and maybe some taco seasoning if you like. Occasionally I will add about a 1/2 cup of our favorite salsa to the meat. Brown your ground beef, adding salt & pepper. 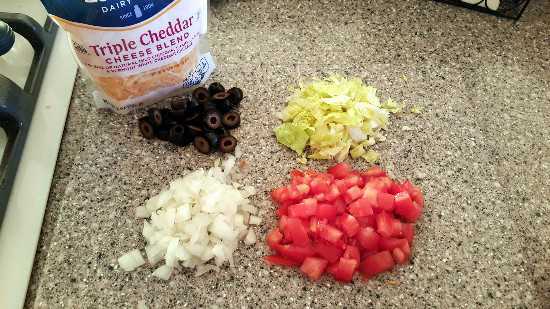 You can also add some taco seasoning if you like. Drain grease. 90/10 doesn't produce much. Heat your Stokes Green Chile sauce. Chop your onions, tomatoes, lettuce and drain your sliced olives. Heat a flour tortilla over the stove top to soften. Lay flat on your plate. Add about a 1/4 pound of the browned ground beef, then add the fillings that you like. 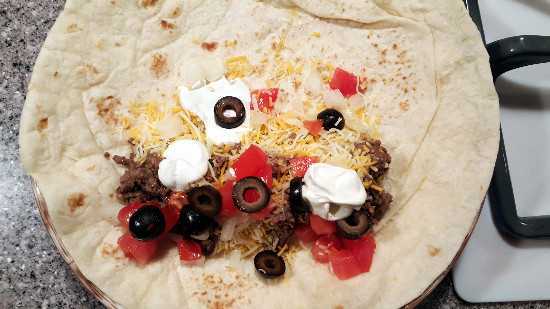 Add, cheese, onions, tomatoes, olives, sour cream and roll your burrito folding in the sides. Spoon some of the Stokes Green Chile Sauce over your burrito, smothering it. Sprinkle with more cheese, and other toppings if you wish. We of course add it all! Cheese, onions, tomatoes, olives, sour cream, lettuce and serve. We just serve with corn tortilla chips.